Lion Air has embarked on the first phase of an aggressive international strategy which is starting to see the fast-growing airline group diversify away from its roots in the Indonesian domestic market. The Mar-2013 launch of an affiliate in Malaysia, Malindo Air, is expected to be followed by joint ventures in other Asian markets, starting with Thailand. A low cost, but hybrid operator, Lion over time will also look to grow its now tiny international network from its home market of Indonesia. Internationalisation with a focus on Southeast Asia is the right strategy for Lion as it cannot continue to rely almost entirely on the Indonesian domestic market. Indonesia has emerged as one of the world’s largest and fastest growing emerging markets. But with nearly 600 aircraft on order Lion needs to hedge its bets and not limit its growth to Indonesia, particularly given the threat that growing infrastructure constraints could lead to slower growth over the medium to long-term. Lion, however, faces huge challenges as it starts to dip its paw in other markets. Establishing a strong brand and distribution network outside Indonesia will be Lion's biggest challenge. Competition in any new market Lion enters will be fierce as it will not have the first low cost mover advantage it had in Indonesia. Pan-Asian low cost airline groups like AirAsia, Jetstar and, to a lesser extent, Tiger, already occupy the high ground. The Lion Air Group has until now focused on exploiting opportunities in Indonesia. The group, which includes regional subsidiary Wings Air, had little reason to be distracted with potential opportunities elsewhere as it quickly grew its fleet from one aircraft in 2000 to passing the 100 aircraft milestone in 2012. Lion shrewdly took advantage of favourable market conditions in Indonesia and weak competitors to become the country’s largest carrier in 2009. The group has since continued to expand its share of a domestic market that in 2012 consisted of more than 70 million passengers and overtook India as the fifth largest in the world. Lion currently has almost a 50% share of Indonesia’s domestic market. Lion owner and CEO Rusdi Kirana, who established the carrier in 2000, stated several times over the years and as far back as 2007 that he was establishing joint ventures in other countries including Australia and Thailand. But only within the last year has Lion followed through on its desire to become a pan-regional player. A joint venture agreement with NADI, a Malaysian aerospace firm which conveniently has close ties to the government, was forged in Sep-2012. Malindo launched services only six months later, silencing sceptics who doubted the Malaysian project or other Lion joint ventures outside Indonesia would come to fruition. Until Malindo, Lion’s track record for following up on planned joint ventures had been less than stellar, including a joint venture agreement with Malaysia’s Berjaya Air that was signed in 2011 and earlier deals with potential partners in Australia and Thailand. Lion now has the drive and international recognition to follow through on its goal of building a pan-Asia group, following the strategy of AirAsia, Jetstar and Tiger. But Lion faces substantial risks with its new ventures. Malindo has launched using its own brand and website. The new brand enables Malindo to market itself as a Malaysian rather than Indonesian carrier and pursue a more hybrid model than Lion, which itself is already a hybrid in some respects. Malindo’s 737s include a business class cabin and a full-service economy product featuring seatback in-flight entertainment monitors, meals, drinks and complimentary checked bags. The decision to go with a separate brand and a significantly different product limits opportunities to pursue synergies between Malindo and Lion. Malindo will have to independently build up a following in Malaysia and fend off aggressive counter attacks from the two incumbents, AirAsia and Malaysia Airlines (MAS). But future challenges facing Lion in Thailand and potential other markets, such as Australia and Vietnam, will be even bigger. In Malaysia, the AirAsia-MAS duopoly was ripe for assault. MAS is a relatively weak flag carrier that is still in restructuring mode while AirAsia’s Malaysian subsidiary has consistently had one of the highest operating profit margins in the industry, including 23% in 2012 and 20% in 1Q2013. The Malaysian domestic market is not huge but there is still room for growth and potentially for a third competitor on major routes. Thailand’s market is only about 10% bigger but is significantly more crowded. Thailand already has two strong well-established LCCs in Thai AirAsia and Thai Airways affiliate Nok Air. Both are expanding rapidly, using proceeds from initial public offerings. Both also have strong local brands and distribution networks – something Lion has in Indonesia but could struggle to replicate in Thailand. There is also a third, much smaller LCC in Thailand in the one-off Orient Thai. The unusual carrier, operating a mixture of 747s, 767s, 737s and MD-80s, made a push in the LCC sector several years ago with One-Two-Go, which ultimately failed, suggesting the difficulty in trying to establish a third major LCC player in the Thai market. Orient Thai closed the One-Two-Go operation in 2008 and has since continued to have an LCC operation domestically under the Orient Thai brand while operating under more of a leisure/charter carrier model on international routes. But over the last couple of years Orient Thai has steadily cut back its domestic operation, using 737s in single class configuration; the reason: intense competition. The Orient Thai domestic network currently consists of only two routes and four daily flights. 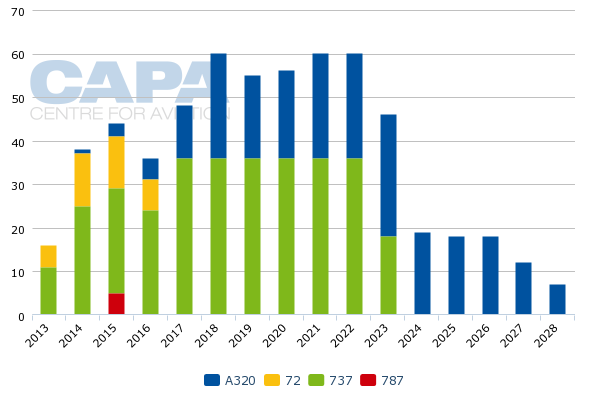 The carrier has cut domestic capacity by a further 56% over the last year and now has just a 2% share of the domestic market, according to CAPA and Innovata data. Nok domestic capacity is up about 45% compared to Jun-2012 levels, accounting for a 26% share of Thailand’s domestic market. 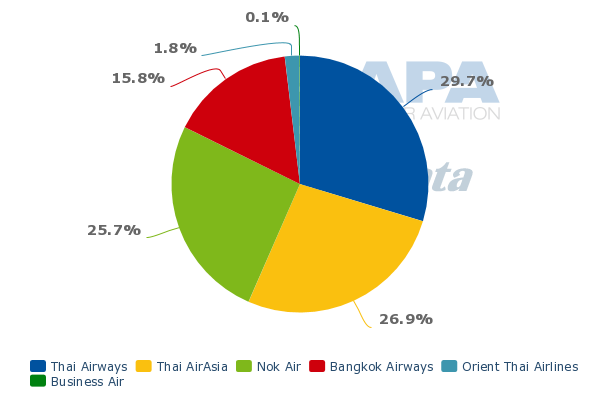 Thai AirAsia, which has grown capacity by 26% year over year, currently has a 27% share of seat capacity. Thailand also has two full-service carriers in Thai Airways and Bangkok Airways. The Thai Airways Group now uses Nok as well as new regional unit Thai Smile, which is positioned as a premium hybrid carrier, to fend off the intensifying competition from AirAsia. If Lion adopts a product strategy in Thailand similar to what it has done in Malaysia with Malindo, it would potentially compete more directly with Thai/Thai Smile and Bangkok Airways. 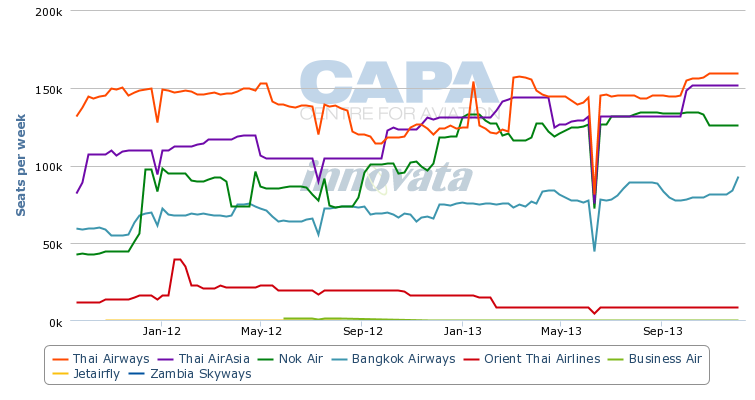 If an all-economy no frill strategy is adopted, it would compete primarily with Nok and AirAsia. Either way Lion will have its hands full. The new Thai carrier is expected to operate from Bangkok’s old airport Don Mueang, the base for Nok and Thai AirAsia. But Lion could opt for a hybrid product, exploiting the convenience of less congested Don Mueang to target the point-to-point business market. However, Don Mueang limits opportunities to connect with other carriers – an opportunity Malindo is looking to exploit by operating out of the main (rather than low-cost) terminal at Kuala Lumpur. The new joint venture has been referred to as Thai Lion, suggesting Lion may look to leverage its main brand and website in Thailand. This would allow for greater synergies and give Lion an opportunity to build its brand in other markets. But the risk is the Lion brand may struggle to gain traction locally. Lion's most likely joint venture partner is a Thai carrier. Orient Thai and now defunct Phuket Airlines are among several Thai carriers with which Lion has discussed potential partnerships over the years. There are several small Thai carriers that could benefit from a tie-up with powerful Lion. The advantage of partnering with a Thai carrier is also to help accelerate the start-up process. While Lion looks to expand in other ASEAN markets, the group needs to make sure it does not become distracted from its goal of continuing to gain market share in Indonesia. Lion aims to grow its share of the Indonesian domestic market to 60%, using a combination of its two budget brands (Lion and Wings) and new full-service carrier Batik. But it will have to continue to pursue double-digit domestic capacity growth domestically to keep up with competitors, which are growing rapidly, and simply maintain its 50% share of the market. In 2013, over half of the group’s aircraft deliveries are being allocated to Malindo, leaving fewer aircraft than in recent years for the Indonesian market. As a result Lion is at risk of seeing its Indonesian market share slip slightly in 2013 rather than make ground on its goal of reaching 60% by 2017. Aircraft deliveries will pick up pace in 2014, as Lion takes delivery of the first of 234 A320s that it ordered in Mar-2013. Lion also plans to accelerate its intake of new 737NGs from two to three aircraft per month in coming years. But even with the group slated to receive approximately 60 aircraft annually in the medium-term, there is a risk that there will not be enough aircraft available to its Indonesian carriers to keep up with competitors. Malindo, the planned new joint venture in Thailand and potential joint ventures in other countries could easily consume half these aircraft during their initial build up phases. For example, Malindo in 2013 is expected to take 10 to 12 737-900ERs plus four ATR 72s. The airline with the largest order book in the world is also adopting some multi-layered strategies that may help lend credibility to its enormously ambitious plans. Although tight-lipped - or even intentionally vague tactically - Lion's idiosyncratic leader clearly has an underlying vision that Asia's vast potential growth is there to be tapped. And that Lion now has sufficient bulk to exploit it. Securing its massive aircraft orders are a flagrant challenge to all future comers in this broad quest. But, with such an expansive approach, some risk mitigation options are clearly prudent, if not essential. There can be no guarantee that expansion opportunities will coincide with the arrival of its waves of new aircraft. One way of covering that risk is to establish subsidiaries across the region, as the other pan-Asian carriers are doing, allowing multiple allocation options as local market conditions vary. Providing alternatives for allocation of the new arrivals can also take different forms. Lion also has established a leasing company in Singapore, Transportation Partners, which is keen to start leasing out some of the aircraft ordered by the group to third-party customers. Further flexibility comes from the ability to make decisions about using the orders for replacement or expansion. Lion and Wings are aiming to complete the phase out of its older types over the next couple of years, including 737-300/400s, MD-80s and Dash 8 turboprops. This potentially leaves even fewer aircraft for growth at the original Lion and Wings brands. Lion, perhaps surprisingly, also risks not having sufficient aircraft to grow its own Indonesian international network. Lion currently only allocates 5% of its seat capacity to its international network. Wings allocates 2% of its capacity to the international market while Batik for now is entirely domestic. Lion’s international network currently consists of just six destinations: Singapore; Kuala Lumpur and Penang in Malaysia; Ho Chi Minh City in Vietnam and Jeddah in Saudi Arabia (Jeddah is served with its infrequently used fleet of two 747-400s). Wings currently serves one international destination, Malacca in Malaysia. The group currently does not have any destinations in North Asia or Australia despite a large portion of these regions being within narrowbody range of Indonesia. While Indonesia is primarily a domestic market, international travel is starting to grow as the middle class expands. Lion has the brand recognition in Indonesia to capitalise on this and grow internationally as Indonesians start to travel more overseas. A bigger international network from Indonesia will also help Lion establish its brand in other markets and provide connections with its growing portfolio of joint ventures. 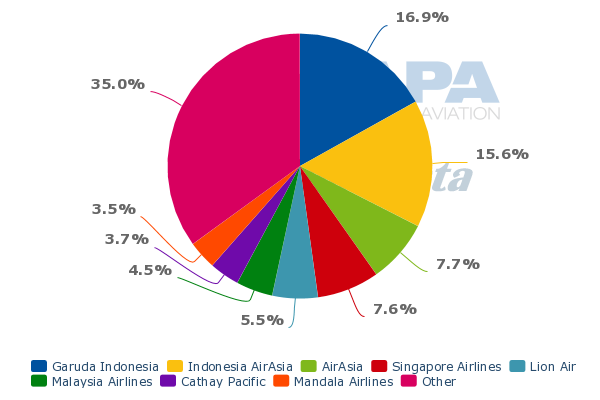 While Lion is by far the largest carrier domestically in Indonesia, its share of the international market currently is less than 7%. The AirAsia Group accounts for a leading 24% share of seat capacity in Indonesia’s international market, followed by 17% for Garuda. Adopting a pan-Asia strategy is a risky but opportunistic move. There may not be room in Asia for more than a couple of big pan-Asian LCC groups. But then again, there has never been a market with the unexploited potential enormity of Asia. It is that star that Lion is chasing. One model, Cebu Pacific, has been very successful at avoiding trying to match AirAsia, Jetstar or Tiger, instead adopting a less ambitious strategy of continuing to focus on its home market with both domestic and international expansion (including a new Philippines-focused widebody operation). With an even bigger home market Lion could easily have followed the Cebu Pacific rather than the AirAsia strategy. The Indonesian market is big enough for a very large LCC without having to diversify. Indonesia’s domestic market is nearly the size of Brazil and is bigger than India, but the largest LCCs from those countries have shown no ambition to establish joint ventures overseas - not yet anyway. The carriers that have traditionally pursued growth through establishing a portfolio of joint ventures in other countries have smaller home markets and were unable to expand otherwise. But the leading LCCs from Brazil and India do not have 600 aircraft on order or the ambitions of Lion. Lion faces extensive risks as it grows its portfolio of carriers. To some degree, Lion is constructing the means to navigate the many hazards before it. If it succeeds in the way it has in Indonesia the group can open the door to an unprecedented level of opportunities and growth, propelling Lion towards the top of the global airline rankings.